Jean Marie Black (nee Nagle) was born on January 8, 1934 in Berwyn, Illinois to Joseph and Ethel (nee Jones) Nagle. She died Sunday, October 14, 2018 at Moorings Health Center in Arlington Heights, IL. 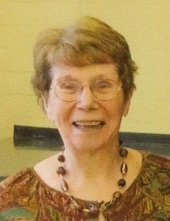 Jean worked as a middle school teacher at Komarek School in North Riverside, IL. before she opened her own personnel consulting company, J.O.B. Personnel in Arlington Heights, which she ran for several years in the 1980's and 1990's. She was an active member of many clubs and PTA, a Rosary College (now Dominican University) Alumnus, St. James Parish Council, President of National Association of Women in Careers; and the Couples Club, a group of couples dating from Rosary College days who met every other month for dinner for 50 years. Jean is survived by her husband, Robert L. Black, Sr.; children, Carolyn (Dr. Stuart) Ferber, Sheila (Robert) Haennicke, Dr. Robert Leo Black, Jr., and Thomas W. Black; grandchildren, David Haennicke, Angelica Rose Haennicke, Samuel Ferber, Joseph Ferber, and Jack Ferber; sister in law Marge Nagle; many nieces, nephews, and cousins. She was preceded in death by brother, Joseph J. Nagle and her parents. Visitation from 4:00 pm until 8:00 pm, Thursday, October 18, 2018 at Glueckert Funeral Home Ltd., 1520 North Arlington Heights Rd. (4 blocks south of Palatine Rd. ), Arlington Heights, IL. Prayers 9:15 am, Friday, October 19, 2018 at the funeral home proceeding to St. Cecilia Catholic Church, 700 S. Meier Rd., Mt. Prospect for Mass at 10:00 am. Interment St. Michael the Archangel Cemetery. In lieu of flowers memorials may be given to Jean M. Black Women in Careers Scholarship, ATTN: Lauren Chilvers, Scholarship and Special Projects Coordinator Harper College Educational Foundation 1200 W. Algonquin Rd., Palatine, IL 60067, <https://donate.harpercollege.edu/sslpage.aspx?pid=298>. "Email Address" would like to share the life celebration of Jean Marie Nagle Black. Click on the "link" to go to share a favorite memory or leave a condolence message for the family.